THEATRE OF VOICES received a Grammy Award for ‘The Little Match Girl Passion’ in 2010 – the year of the group’s 20th anniversary. Theatre of Voices was founded in California by Paul Hillier, but is now based in Denmark. Current projects include music ranging from Perotin to Dowland, Carissimi, Buxtehude and Bach, and many of today’s most eminent composers such as Berio, Pärt, Reich, Cage, Pelle Gudmundsen-Holmgreen and Stockhausen. 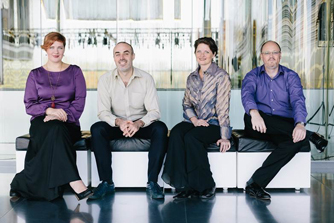 Theatre of Voices works and records with some of the world’s best instrumentalists, including London Sinfonietta and Kronos Quartet, and has performed regularly at Edinburgh Festival, Barbican Centre and Carnegie Hall – with sold out concerts. 2008 included the opening of Berliner Festspiele with Stockhausen’s Stimmung at the composer’s own request, along with a performance at BBC Proms. The past few years have included tours to Hong Kong, Australia, Sweden, UK, Mexico, the US, Italy, France, Poland, Belgium, Germany, Portugal, Luxemburg and Holland. In 2013 Theatre of Voices was nominated for the Nordic Council Music Prize, and in 2014, My Heart’s in the Highlands from Theatre of Voices’ Pärt CD Creator Spiritus was used in Oscar-winning Italian movie La Grande Bellezza. The same track was featured in MOJO MAGAZINE, selected by Nick Cave and the Bad Seeds as one of their favorites. Theatre of Voices has recorded more than 20 CDs for Harmonia Mundi USA and Dacapo-Records in Denmark. The ensemble also offers workshops and works on film projects – currently with Danish documentatist Phie Amboe and Oscar nominated Icelandic composer Jóhann Jóhannsson.